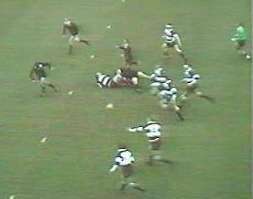 Barbarians rugby 1973 and the Phil Bennett brilliant sidesteps counter-attack from near his own line - great rugby play, fantastic try. 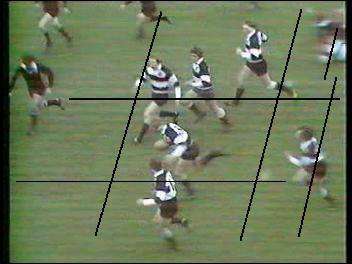 Barbarians are in the black and white hoops running from the right. Bennett covers after NZ winger Bryan Williams kicks ahead. He runs hard and finally gathers a bobbling ball about 10 metres out from his own line. Bennett, hounded by Scown(6), is running at an angle towards his own goal-line. He swerves left, now parallel with the goal-line he slows and throws a fantastic SIDESTEP!, going left. He throws off Scown and evades Hurst(12) who was trying to cut off what he must have thought to be a cross-field run. Facing straight upfield and certain to be caught by Whiting(5), Bennett throws a second SIDESTEP! !, evading him by going left. He is immediately threatened by Kirkpatrick(7) the next defender and evades him with yet another great SIDESTEP!! !, to the left! At this point he draws the next defender Urlich(2) and passes to support, out wide to his left. He went through a third of the opposition in about 15 - 20 paces! Now you can, do it with EvtecHs. and Gareth Edwards streaks for the New Zealand line to score one of the best team tries ever recorded. Was the pass to Edwards a forward pass ? The Guardian, in "Why this game was the finest ever played" reports that referee Georges Domercq was within yards of the final pass (Quinnell to Edwards) and says it was not forward. I used to think it was forward. Then I used my video editing software to look closely at clues. This type of software is pretty cheap these days and fun to have. In the lead up to the last pass, see how well Mr Domercq, the French referee is positioned to control the game. The ball is on its way to Quinnell as he approaches the dashes marking the New Zealand ten metre line. Quinnell with the ball, leaves the ten metre line behind. A black line connects three white dashes of the ten metre line. 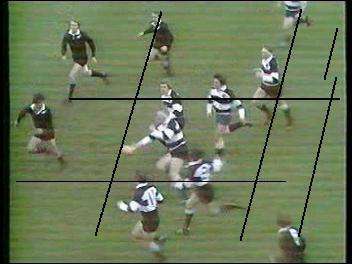 The black box around the play contains a line parallel to the first line, showing the angle of the pass we are about to see. 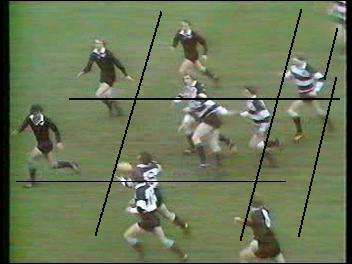 The box moves with the camera, Quinnell reaches forward and passes the ball left as he falls away sideways to his right. Edwards is behind Quinnell, bursting onto the ball, going like the clappers. The ball travels along the black line from where it was released. This proves to me it was not passed forward, it was a valid pass. Edwards takes a fantastic pass on the burst and goes on to score. My opinion is...this was not a forward pass. Barbarians rugby - some of the most enjoyable rugby and one of the greatest tries you'll ever see! It`s on the video "101 Best Tries - with Cliff Morgan" - at around 12:31. You'll also find it with other rugby clips on the internet. Look for "Gareth Edwards", "Greatest try ever" and similar. But you just can't beat having your own copy and being able to watch it in slow motion and see what really happened! There are tapes and DVDs containing the whole game. Well worth having! The New Zealand team played as selected, however two of the Barbarians were unable to play on the day. Gerald Davies was replaced on the wing by John Bevan and Tom David played instead of Mervyn Davies. David actually played flanker and Quinell changed from flanker to number 8. Frame grabs from "The greatest try of all time...", linked above.